I originally wrote the following bit when the HP Lovecraft 125th Anniversary articles and posts were going around. But the WFA has just announced that they're no longer using Lovecraft's likeness on their prize. That doesn't bother me. It's their award, if they want to make a change, more power to them! It's the celebrating that people are doing, and with that the repetition of the unfair denigration of Lovecraft's character, that I care about. It's important, because it's the difference between "an author with some bad views" and a monster. The ability to enjoy the work of an author and discuss it for what it is, or not. The ability to discuss an author with any sense of civility, or not. Whatever Lovecraft was, he wasn't a monster. Not even close. HP Lovecraft wouldn't even be an extreme or extraordinary racist in OUR time, let alone his or any other. What was extraordinary was Lovecraft's articulation of his racism, which is to be expected because Lovecraft was an exceptionally talented and evocative writer all-'round. Unless of course you think having or expressing racist thoughts in an articulate manner is more extreme or extraordinary than, say, pointing a loaded gun at someone and pulling the trigger because of that person's race. Or getting the crew together and hanging one, or more, people of a different race than your own. Or conducting medical experiments on hundreds of people of a specific ethnicity without their knowledge. Or imprisoning over a hundred thousand people in camps simply because of their ethnicity. Or segregating schools and businesses by race. Or burning or dynamiting churches attended by certain ethnicities. Or incarcerating minorities at a far, far greater rate than the majority demographic. People did these things, and in many cases are still doing them. Lovecraft didn't. Surely, surely, Lovecraft's "I get anxious out in public around those people and write letters to my friends about it when I get home" acts of racism are quite run-of-the-mill as far as these things go. Fact: Lovecraft was indeed racist, and this is indeed relevant to his work. Also fact: Some of his published work certainly contains blatantly racist elements, but no more so than his peers or forebears. The only reason we know about his so-called "extreme" racism is because we've trawled through his personal correspondence and effects, and the only reason anyone did that in the first place was because of his status as a writer of enormous talent. Conclusion: Those trying, straining even, to portray Lovecraft as some sort of super-racist above and beyond the norm of his times have absolutely no sense of proportion. They poison, not promote, discussion on the matter. "Honesty compels us to admit that this is a Lovecraft story (although almost the only one) in which he gives ugly narrative (as opposed to descriptive) vent to his racism. Ethnic minorities (Ricci, Czanek, and Silva, as Joshi points out, represent Italians, Poles, and Portuguese, the three main non-Anglo immigrant groups in Providence in 1920) die horribly at the hands of Outside forces, directed by an old Anglo-Saxon New Englander. Worse yet, their deaths are obviously played for comic effect." Emphasis is mine, because Italian and Polish is 75% of my ancestry, and some of them were coming off the boat to live in New England right at the time Lovecraft was writing this stuff and others were first generation there. I am the living nemesis of Lovecraft, the majority of my family line being exactly the people he detested outside his window, and the living realization of his fears as a crossbreed offspring of the wicked "alien stock" having its way with the pure Anglo bloodlines. Oh yeah, and the author of that adventure I put up in PDF last week (The Squid, the Cabal, and the Old Man), the one playing in Lovecraft's arena of cosmic forces and English scientific doings? Andre "I'd just add some tentacles" Novoa is Portuguese. 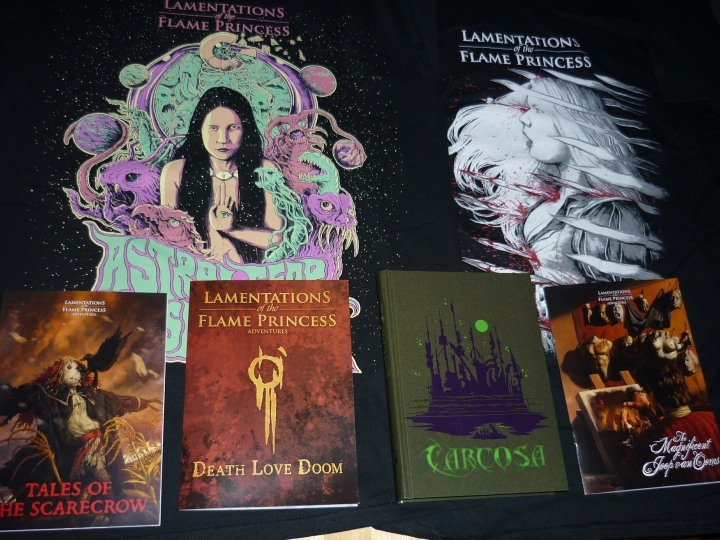 Now Available at the LotFP Store: New Shirts, Reprints! Now on sale at the LotFP Store! plus we've found another couple boxes of A Red & Pleasant Land in our storage space! Carcosa reprint limited to 500* copies, Ooms and DLD and Scarecrow to 250 each, and we have 50 RPLs left. 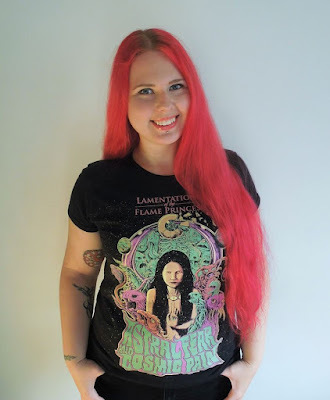 And they haven't made an announcement so I can't swear by this, but the Finnish post office has raised postage rates every single year that LotFP has been in business, so this just might be your last chance to add in back catalog LotFP releases (or the last of our Flame Princess and Alice shirts!) and get the current postage rates. * all amounts are subject to the printers delivering a bit more or less than ordered.